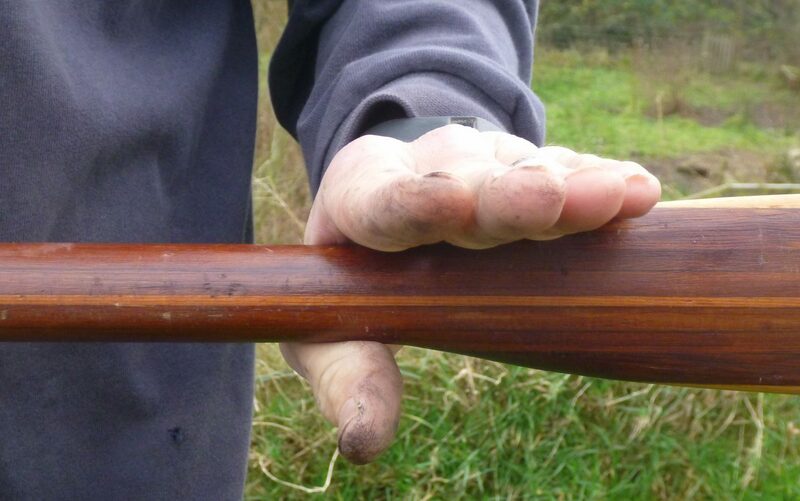 red cedar to produce a strong paddle with a comfortable weight in the hands. The laminates produce a beautiful visual effect as well as enhancing the paddle’s strength. The tips are reinforced with an epoxy fillet and the blade edges with hardwood strips. 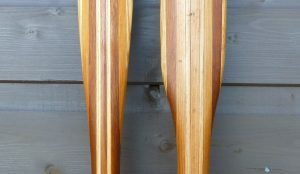 We make two styles of the classic Greenland sea kayak paddle: a standard version and a storm paddle. Both of these are available in a traditional narrow version, a westernised wider blade and a compromise half way between the two. The storm paddle is a shorter version with the same blade length but a shorter shaft. This shape offers significantly less resistance to wind since nearly three quarters of the paddle disappears into the water on each stoke. This requires the development of the specialized slide-stroke where the hands slide up and down the non-paddled blade with each stroke. Storm paddles are made from dimensions used to make a full sized paddle and then the loom length reduced to 8 inches. Length: This is based on your full reach above your head. When fully extended, but not overly stretching, your finger tips should just curl over the end of the blade. right hand across to the same place on your left hand. There are a number of ways to take the measurement but the simplest is to hold a broomstick or similar and adjust your hands to your comfortable paddle grip and then get someone to measure the distance. Shoulder profile: The blade can be shaped to taper gently into the loom or to have a more pronounced shoulder. The more tapered profile is more comfortable for sliding the shaft through the hands for extended sweep strokes. Some people prefer the more pronounced shoulder to help locate the hands on the blade for rolling. Loom circumference: We make the looms 1 1/4 inch diameter as a standard. Traditional measurements are thicker but we have found this to be the most popular comfortable size. The wider the blade, the more work you will need per stroke, but also the greater power you can transmit into moving the boat. Traditional blades are quite narrow. Please note that unless you are paddling a boat that is ‘perfect’ for your size and dimensions, having the perfect ‘made to measure’ Greenland paddle needs to have some compromise. 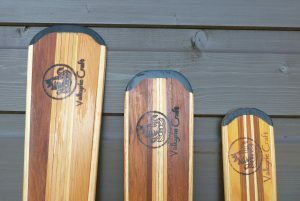 Traditional Greenland paddle dimensions are based on the optimum size to paddle a boat built to fit the paddler! If you paddle a boat longer and/or wider than a Greenlander would have made for you, you will probably need a paddle that is longer than the ‘perfect’ measure. If you want to use the paddle for paddling that requires lots of hard work (e.g. breaking out through surf or working against tide) you probably want a wider than traditional blade head. 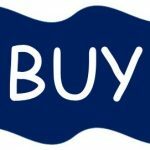 Why use a Greenland Paddle. The key advantage of these paddles is the lighter and effectively more restful paddling rhythm that they develop. The swinging motion develops greater use of the core muscles, reducing arm and shoulder fatigue, and largely eliminates wrist flex and ultimately wrist injury, particularly over long distance touring. Greenland paddles require a little practise to develop proficiency but it is building familiarity not overcoming complexity that requires the practise. They have a significantly simpler shape, without the variety of scoops, feathers and compound blade angles found in modern western paddles. The Greenland paddle’s narrow profile means that it is less prone than a typical sea paddle to flutter and twist in the water and the wind. This makes paddling smoother and combines to make rolling, bracing and paddling more straightforward; because the blades are symmetrical there is no need to search for the right position to prepare for the required stroke. This means that many paddlers find the Greenland paddle easier to learn to roll with. Without doubt once you develop familiarity with a Greenland paddle you won’t feel a desire to return to the modern western imitation! The Greenland Stick is the ultimate sea paddle developed over centuries of use in a demanding environment. John took time to explain the various issues around making my ideal paddle before taking measurements and making it up for me. I’ve only had it a month and now don’t touch my old sea paddle. Dear John, my fantastic paddle came in the mail today. I’m so happy and proud to have a paddle made from Valkyrie craft! Could you please repeat for me the different woods used? I would love to be able to answer when people ask. I send you a big hug from Norway. This is the perfect memory from my stay in Northern-Ireland! Hi John, just wanted to say thanks for the paddle!! Absolutely superb. So much power, and control. How often should I oil it?!? A greenland paddle was recommended to me following a shoulder injury that nearly put paid to my sea paddling career. 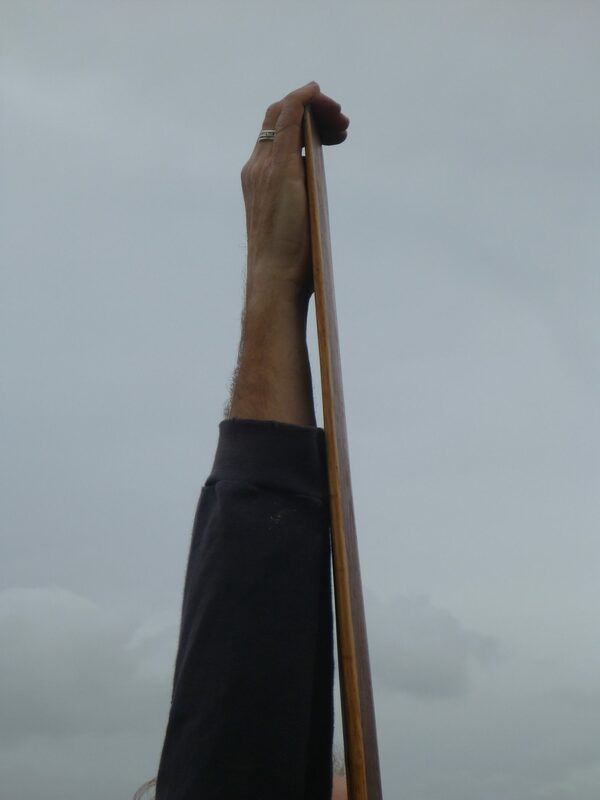 I was told that a ‘Greenland Stick’ would reduce strain on my wrists, elbows and shoulders and that with care I should be able to get back into the boat. 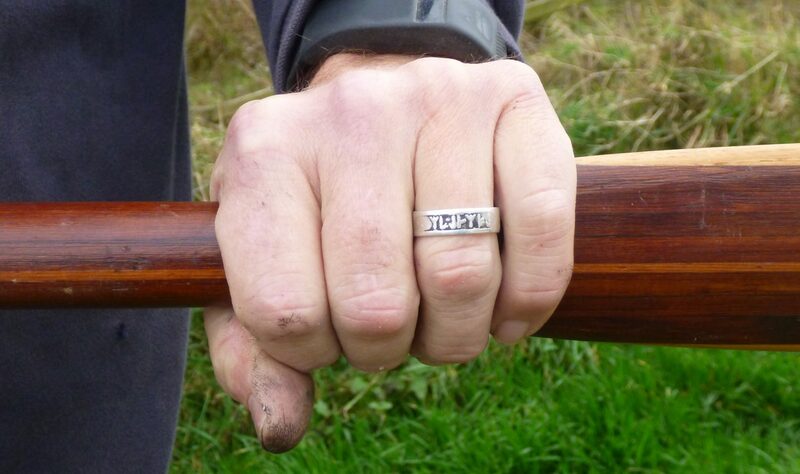 John was very informative and took time to talk through the paddle dimensions with me – I had the paddle made up with a traditional sized blade to reduce the chance of me over doing it – and I’m back in the boat. I have to concentrate on keeping good core rotation but the blade certainly has been a key part of my recovery.